Two of my four kids have the flu. Flu A, whatever that is. All I know is that it lasts 7-10 days and I don’t want it! 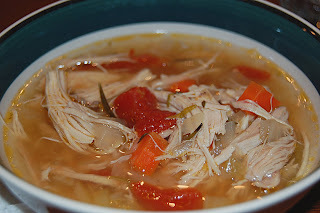 Enter this recipe for Virus Killing Soup, which was shared on the Sonlight Forums by Chloe. The soup tastes fantastic. It really should have a different name, because Virus Killing isn’t real appetizing. However, that is the point of the soup so we’ll go with it. cayenne pepper, about 1 tsp. Throw all of that in a big pot. See all that garlic? That’s going to kill those viruses. Don’t worry about the amount of garlic being too strong. It really isn’t when the soup is done and it smells fantastic while it cooks. Don’t worry about the cayenne pepper either. It provides warmth that will clear your sinuses, but it’s not spicy at all. 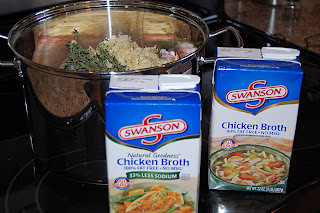 Pour a couple boxes or cans of chicken broth over the top, then top it off with water so that the chicken is completely covered. You can also use only water if you like. Cook it on the stove top until the chicken starts to fall apart. Then remove the chicken and strain the broth a bit, getting out the long stems from the spices and all the chicken bones. Set the chicken aside to cool a bit. Now you’ll want to add some veggies. I used some carrots, onion, a stalk of celery and a fennel bulb. You can also add leeks and red pepper, but I didn’t have any of those. Chop the veggies and saute them in oil until tender. If you have it add 1/2 cup of good white wine and some salt and pepper. Add the veggies into the pot of broth and simmer for a while. I added about 6 cups of water to the broth at this point. It had really cooked down and was very rich. Take the chicken off the bones and chop it up. Add it back into the soup. Add in a can or two of diced tomatoes. You can also add frozen green beans, peas, zucchini, flat leaf parsley. I don’t know if this will heal my kids faster or prevent the rest of us from getting the flu, but it tasted great. I ate 3 bowls for dinner. Yum! that sounds dee-lish. flu or not! this looks so good, I almost wish I was sick…NOT!! lol…hope everyone there gets better soon. Your soup looks REALLY good!! Yes I have heard that garlic has healing properties, this sounds really similar to my mom’s chicken noodle soup that we believe helps heal a cold. Hey, it’s worth a shot and that soup looks delish. Hope your kids get well sooner that 7-10 days. Hope all are feeling better soon. Super yum. I love the name of this soup! It’s why I came to visit! Well I’ve put off following your blog for too long – I’ll admit, I was afraid. Sooo much yummy food when I’m trying to slim down! Alas, I can’t help myself – I come here anyway, might as well make it easier on myself. Thanks (semi-sarcastically) for all the recipes, many of which actually seem to be healthy. I cannot wait to try this soup. Thanks for stopping by from SITS yesterday! That soup looks yummy! Hope it kept you all well!! Your soup looks great…I was hoping you’d tell ME what to make for dinner this week. I have no idea. I hope everyone feels better soon, the soup sure looks good. 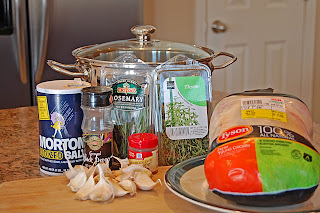 That soup looks so good and easy to make thanks for sharing love the garlic. Garlic will kill anything. AH Ha! I am so going to try this this week! thank you for stopping by my blog! I look forwad to getting to know you via blogs! Hi, I just found your blog…great recipes!!! Came by from SITS comments. 2) You cook at home!! I do too, although I love to eat out, but we just don’t do that very often so I try to recreate what I would buy at a restaurant. looks deeeeelish! thanks for posting it! 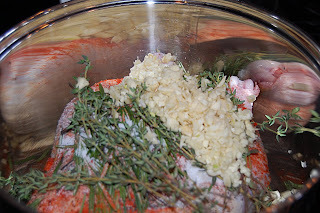 i just posted about this on my blog…my house smells WONDERFUL!!!! Wow! This looks wonderful. I am going to have to make a menu plan change and make this tomorrow! I actually just found your blog and am excited to look through all your recipes!! Trying hard to cut back and still have healthy yummy food. Looks like this one is a keeper! Whoooops!! LOL I thought this was my close friend’s blog! LOL I only realized it was not after I sent in my first comment. This soup looks marvelous and I love your blog! Oh it’s so good!!! And pretty, too! Thanks for the wonderful recipes. I was wondering if anyone else had a hard time printing the individual recipes this week as you instructed? This is soup is delicious! I used parsley because it was the only fresh herb I had on hand. The only vegetables I added were celery, onions, and carrots. And, because I’m lazy, I didn’t completely peel all of the garlic. I knew I would be straining the broth, so I chopped the garlic very coarsely and removed some but not all of the peel. There is something wonderful about soup made from a whole chicken, but it does take a fair amount of time. In a time crunch I think you could make this by starting with skinless, boneless chicken breasts and poaching them in chicken broth. Thanks for a terrific recipe. aren’t you supposed to give credit for recipes you post on your blog? Seems I have seen this recipe before. Mary, You may have seen this recipe before. I gave credit and a link to Chloe’s blog in the first paragraph of the post. Made your soup tonight – yum! This soup was FANTASTIC! 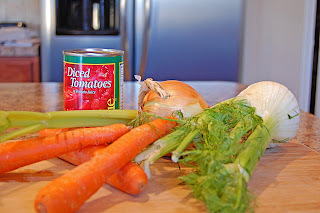 We just have nasty colds around here, not the flu, but this soup really hit the spot. We ate it with a loaf of garlic bread (more garlic – yum!) and a glass of orange juice. It was so good. Thank you so much for sharing this! Okay, I just threw everything in the slow cooker, not realizing this is a stovetop recipe. Will the results be more or less the same? Marla, you’ll just need to cook the chicken for quite a long time in the slow cooker. If you want to use the slow cooker for the whole thing (after chicken is cooked and removing it from the bone etc. ), you’ll need quite a few more hours to be sure the veggies are cooked through. Also, you’ll be adding water to the pot, along with the veggies so it might not fit in the slow cooker at that point. Yes, I transferred it all to stove top – I still have several hours until supper time so I should be okay. The lovely garlic smell is killing me though. I don’t think hubby will be too impressed when he gets home. Marla, it does have a strong smell, but it is so good! Hope you all like it and I hope it prevents/helps your colds and viruses. Should I cover the pot while simmering? About how long does this soup take from start to finish? I cover the pot while simmering, but leave the lid tipped a bit. It will take several hours to make this soup.